Our next meeting will take place on Saturday 20th October, at Blackrock Castle Observatory, starting at 8.00pm. The talk is by Keir Liddle of Edinburgh Skeptics, who will take a close look at the Nocebo Effect. Keir will join us from Scotland, via the sufficiently advanced technology* of Skype. On the night, we will also have a short (live!) presentation from the editor of Walton Magazine, a new quarterly STEM publication based in Cork. Most people are familiar with the placebo effect—where an inert substance appears to cause an improvement in a patient’s symptoms (or at least makes them believe things are getting better). But we may be less aware of it’s corollary, the nocebo effect. In medicine, a nocebo reaction or response refers to harmful, unpleasant, or undesirable effects a subject manifests after receiving an inert dummy drug or placebo. Nocebo responses are not chemically generated and are due only to the subject’s pessimistic belief and expectation that the inert drug will produce negative consequences. In these cases, there is no “real” drug involved, but the actual negative consequences of the administration of the inert drug, which may be physiological, behavioural, emotional, and/or cognitive, are nonetheless real. 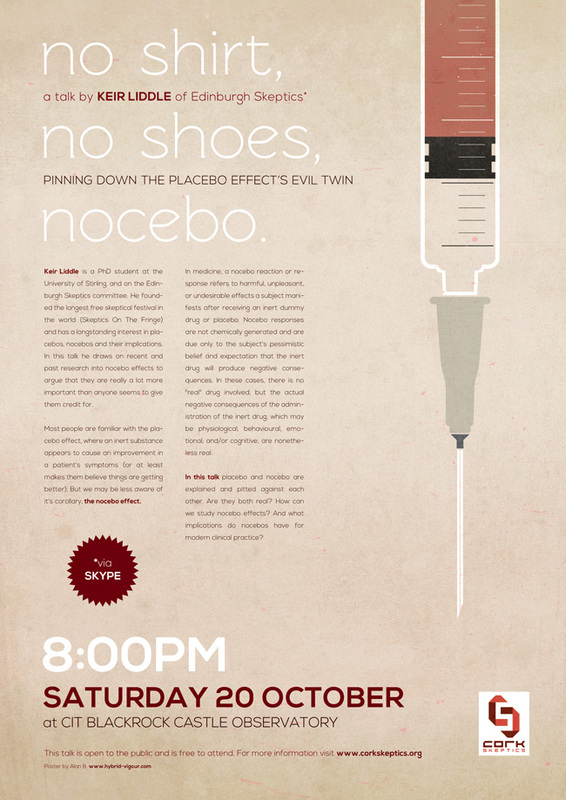 In this talk placebo and nocebo are explained and pitted against each other. Are they both real? How can we study nocebo effects? And what implications do nocebos have for modern clinical practice? Keir Liddle is a PhD student at the University of Stirling, and on the Edinburgh Skeptics committee. He founded the longest free skeptical festival in the world (Skeptics On The Fringe) and has a longstanding interest in placebos, nocebos and their implications. In this talk he draws on recent and past research into nocebo effects to argue that they are really a lot more important than anyone seems to give them credit for. Categories: Events, Health, Psychology, Science, Skepticism, Skeptics In The Castle | Tags: blackrock castle observatory, body, cognition, cork, doctor, drug, edinburgh, health, ireland, medicine, nocebo, outreach, patient, physiology, placebo, poster, research, science, skeptic, skeptics in the pub, Skype, STEM, talk | Permalink.